Throughout his life, Fred Hollows worked in underprivileged communities around the world. He first noticed the lack of eye health in Australian rural Indigenous communities, and the higher rate of blinding Trachoma. During the 1980s, Fred travelled to Nepal, Burma, Sri Lanka, India, and Bangladesh with the World Health Organisation. What he saw in these places urged him to find a way to make eye healthcare more affordable and accessible. To help, he founded factories in Nepal and Eritrea to produce intraocular lenses to treat cataracts. The Fred Hollows Foundation was founded by Fred and Gabi Hollows in 1992, a year before Fred Hollows passed away. The Fred Hollows Foundation is active in over 25 countries around the world, providing developing communities throughout the world and Indigenous communities within Australia with affordable eye care to put an end to avoidable blindness. By doing this we can ensure that the people in these communities have the best opportunities in life, aiming to help people out of poverty. Due to their amazing work, The Fred Hollows Foundation is one of the most reputable foundations nationally and internationally. They rank in the Top 5 Reputable Charities in Australia, were named one of The Global Journal’s top 50 non-profit organisations and were named the 2013 Australian Charity of the Year. Our partnership is focused on the Vietnam Child Eye Care Program. The Fred Hollows Foundation works in partnership with the Government of Vietnam to increase the quality of eye care services, strengthen the capacity of medical institutes, advocate to the government and support the integration of eye health into the public healthcare system to improve access to eye care at all levels. Since starting our partnership in 2016, TechnologyOne has helped 13,016 children in Vietnam restore their eyesight, enabling them to reach their full potential and continue their education. It is fundamental that children all around the world have the opportunity for a proper education, these children will change our future. How a Pair of Spectacles Changed a Student’s Life! Two years ago, a student in grade eight, Nguyen Manh Nghia, struggled at school, when he realised that he could not clearly see the letters on the board. He knew he had a problem with his vision, but he didn’t know where or how to seek help. “I didn’t know why [I could not see clearly] and I also didn’t care much about that fact,” says Nghia. Nghia was born in a poor family in the rural area of Hai Duong province in Viet Nam. He looks slimmer than others at his age, but he is confident and presents himself well. He makes up for his family’s lack of resources with his willingness to take more responsibilities at home. He helps his parents with household chores such as cooking and cleaning. He also looks after his younger brother and sister. “My parents do not have enough time to take care of us. So, as the eldest son, I do everything that I can – even being ‘a teacher’ to my younger brother and sister,” Nghia says with his smile. Being a responsible student and son, having difficulties with his vision posed a great challenge. Fortunately, his teacher, Ms Quynh, was able to spot Nghia’s problem and acted quickly. Ms Quynh was one of the teachers trained last year by the Viet Nam Child Eye Care Project of the Fred Hollows Foundation. Because of her training, she found out that Nghia had myopia or short sightedness -- a problem that could easily be solved by giving Nghia the right pair of spectacles. 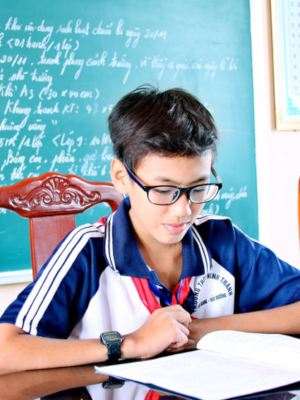 When Nghia finally had his spectacles, he became more sociable with his classmates, and more active in his classes. His grades improved since last semester, thanks to his restored vision. Aside from his improved grades, he finds another benefit from his spectacles. ‘’Wearing spectacles not only helps me to see clearly but it also makes me more attractive!” Nghia says with a happy laugh. Nghia has become “an ambassador” for eye health. In his school, he actively participates in various eye health events, sharing his basic knowledge and experience of eye care. He also shares this knowledge with his family and friends outside school. Thanks to his teacher and his new set of spectacles, Nghia’s life is back to normal. Even more, he is happy to reach out to other children who have similar problems with vision.